The wealthy South African family accused of wielding undue influence through its links to President Jacob Zuma says it has been the victim of "xenophobic and hate speech". The family took out two pages in a newspaper it owns to deny the allegations and respond to criticism. Deputy Finance Minister Mcebesi Jonas has said that he was offered the top job by a member of the Gupta family. This has led to increasing pressure on President Zuma. Has Gupta family sealed Jacob Zuma's fate? "As the global economic slowdown began to bite, the family became the scapegoat for every calamity and misfortune that South Africa has faced," the Guptas said in a statement, carried in the local New Age newspaper. The office of the country's anti-corruption watchdog, known as the Public Protector, has said it is considering whether to investigate the involvement of the Gupta family in state affairs. Questioned by the opposition in parliament on Thursday about Mr Jonas' allegation, Mr Zuma said: "I'm in charge of the government. 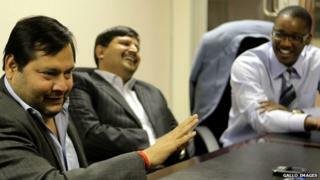 There is no minister who was ever appointed by the Guptas." Mr Zuma's presidency has been marred by allegations of corruption, cronyism and incompetence, amid a worsening economic situation. Last year, South Africa was hit by a wave of xenophobic violence against African migrants. A senior governing party official warned on Thursday that the country risked turning into a "mafia state". Gwede Mantashe is the third most powerful person in the governing African National Congress (ANC), and his remarks suggest Mr Zuma may be losing the confidence of influential members of the party as well, correspondents say. Senior ANC officials are meeting this weekend and they may examine Mr Zuma's relationship with the Guptas. Bongi Ngema-Zuma, one of the president's wives, used to work for the Gupta-controlled JIC Mining Services as a communications officer. Duduzile Zuma, his daughter, was a director at Sahara Computers. Duduzane Zuma, a son, is a director in some Gupta-owned companies. The Guptas, who arrived in South Africa from India in 1993, have huge interests in computers, air travel, energy, and technology. In 2013, there was an outcry after a private jet carrying guests to the wedding of a Gupta family member was allowed to land at a South African military air force base in Pretoria.